Poisoned Pen Press, 9781590589434, 290pp. It should have been routine, a simple assignment for PI Sam Blackman and his partner Nakayla Robertson. Follow a history professor who's suing a spinal surgeon for malpractice and catch her in physical activities that undercut her claim. When professor Janice Wainwright visits Connemara, Carl Sandburg's home in Flat Rock, N.C., and climbs the arduous trail to the top of Glassy Mountain, Sam believes he has the evidence needed to expose her--until he finds the woman semiconscious and bleeding on the mountain's granite outcropping. Her final words: "It's the Sandburg verses. The Sandburg verses." As the person to discover the dying woman, Sam becomes the first suspect. An autopsy reveals painkillers in her blood and solid proof of the surgeon's errors. Why did this suffering woman attempt to climb the mountain? Did she stumble and fall? Did someone cause her death? 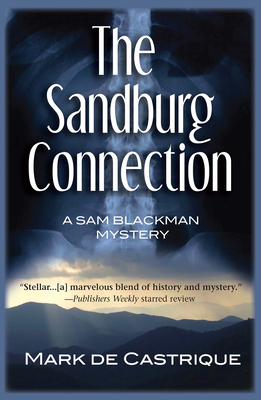 A break-in at the Wainwright farmhouse and the theft of Sandburg volumes convince Sam someone is seeking potentially deadly information. But what did Pulitzer Prize winner Sandburg have in his literary collection that inspires multiple murders? And who will be targeted next?